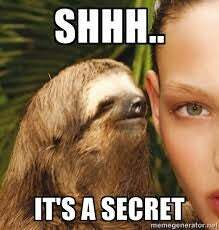 Tell us a secret. It can be as racy or as mundane as you like. We're all friends here, we won't tell. I'm a boring middle aged man so I don't really have anything racy to share (besides even if I had anything WinnieTheWoot reads this and I don't need to find her a therapist) but I will tell you how to make the BEST pecan pie. Most recipes I've seen call for corn syrup and bourbon. Don't listen to them. Use King Golden Syrup and Cointreau. Trust me.